Sept. 26, 2011, 2:30 p.m.
Facebook’s Journalist Program Manager explains the changes and how journos can take advantage of them. By Vadim Lavrusik @lavrusik Sept. 26, 2011, 2:30 p.m.
Editor’s Note: Vadim Lavrusik, Facebook’s Journalist Program Manager, is responsible for building and managing programs that help journalists, in various ways, make use of Facebook in their work. Below, he explains Facebook’s recent design changes. Facebook has released several updates in the last month that will affect how journalists use the platform for reporting and storytelling. Many of these new features will make it easier for journalists to distribute their content and keep up with sources of information. Some of the relevant changes for journalists include Subscribe, which enables readers to subscribe to journalists’ public updates, and a redesigned News Feed — complete with a newly introduced Ticker for real-time updates that makes it easier to keep up with the news that’s most important to you. The new lists also make it easier for you to target updates to a specific group of people, and to see a customized stream of news from them. The updates also include Timeline, which showcases not only the most recent stories from a single user, but also contextualizes who that user is through a historic timeline. Timeline has the potential to create a “face book” that truly serves as a digital representation of a the self: an authentic identity that has been molded over time through life experiences, personal interests, and the people we share our lives with — the people for whom we aren’t afraid to reveal our authentic identity. With all that in mind, we wanted to provide a breakdown of what these new updates mean for journalists and how journalists can use some of the new features in their reporting. Subscribe: Subscribe enables journalists to update their broader community of readers and sources, while reserving personal updates for friends only. It also allows journalists to keep up with sources without having to friend them, which can often give rise to conflicts of interest. Because the feature is opt-in, journalists who want to enable readers to subscribe to them have to turn on the feature. Since its launch, the feature has been adopted by journalists from around the world and includes the likes of NBC’s Ann Curry and Lydia Polgreen, The New York Times’ South Asia correspondent. 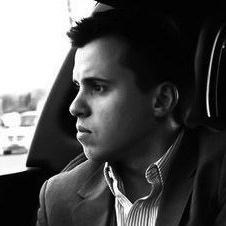 Subscribe enables journalists to separate their personal updates and connections from their professional without having to create a professional Page. You’re able to use your profile to do everything from contacting sources you want to interview, to distributing content to subscribers, to keeping up with personal friends. And your audience, for their part, can connect with you and keep up with your content without having to add you as a friend. They can simply subscribe. Subscribe is also an easy way for journalists to keep up with sources by subscribing to their updates. After you subscribe to particular sources, you will start getting their updates in your News Feed. 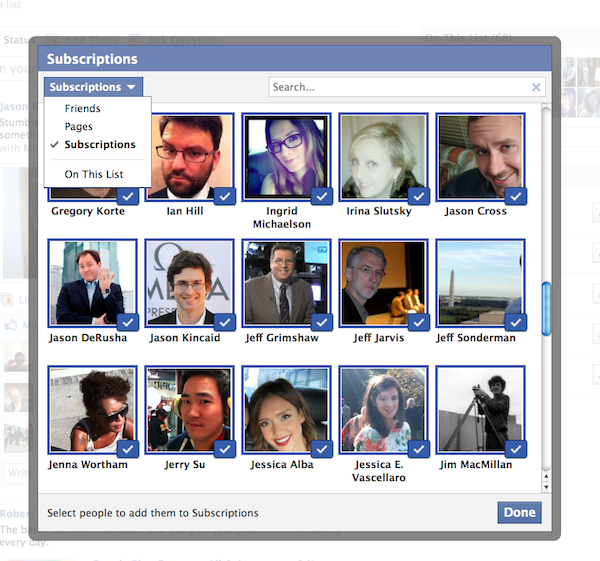 Also, you can customize what kind of updates you get from each individual source within your News Feed. Timeline: Timeline, which is going to be phased in as the new profile, enables users to access their historical content and to fill in their life experiences retroactively, on a digital timeline. People now have the opportunity to share their stories not only with those who are in their lives now, but also with the generations to come — by creating a digital and historical footprint. This means that journalists who are trying to locate sources on Facebook will be able to learn more about those people through the historical context depicted on their timeline of public posts. Aside from that historical information and the fuller picture of sources that comes with it, journalists will also be able to use the timeline feature to access their own archived content that they’ve shared. Up until Timeline, it was difficult to go back and find a story you’ve shared in the past — one that you may want to, for example, reference in an article you’re writing. The feature will serve as a better bookmarking tool. 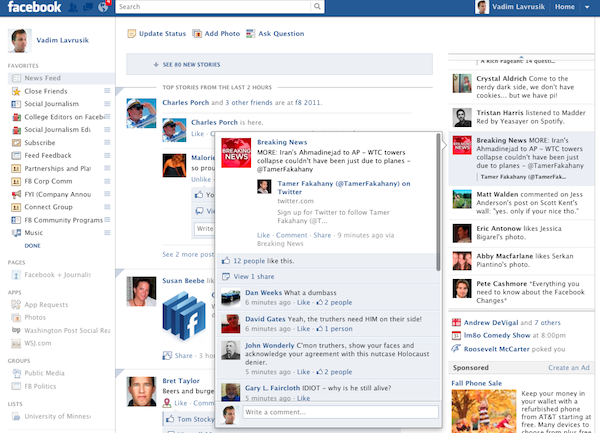 News Feed & the Real-Time Ticker: The new layout puts top news and most recent stories into one stream. The idea is to simplify how users keep track of the news that’s important to them. If you haven’t visited Facebook for a few days, for example, you’re probably interested in the top news. If you’ve already looked at your News Feed recently, on the other hand, you probably want to see only recent stories. The News Feed now functions more like your own personalized newspaper with a real-time twist. The top news stories first show up at the top of the feed; after you’ve seen them, you’ll be able to see recent stories based on what your connections are sharing and doing on Facebook. The content within the main feed is still filtered for quality, and the overall amount of top stories that are being shown to visitors hasn’t decreased. For news organizations and journalists sharing their content, this means that their quality content is still showcased, front and center. The biggest change in how users consume journalists’ content will come with the Ticker, which shows you activity in real-time. This means that breaking news is more likely to be seen, and more quickly, by users. When a user hovers over something in their ticker, they can interact with the story and share it with their friends. Because the ticker is real-time, news organizations may have to reconsider how often they publish content. The bottom line: The News Feed continues to reward quality content by surfacing it as a top story within the main News Feed, but it also provides greater exposure to timely and breaking stories. New Character Limit for Status Updates: The new 5,000-character limit for status updates enables journalists to post more in-depth and detailed micro stories as they report on-the-go. Though journalists have used the Notes feature to write longer posts in the past (and sometimes as a blogging tool, as well), the new character limit enables journalists to write in-depth updates when rich formatting is unnecessary. Friend Lists: The newly re-launched lists enable journalists to better organize their sources on Facebook and to have better control of whom they publish to. Lists enable you to better categorize your connections, which includes your friends, those you’re subscribed to, and Pages you have liked. For example, a journalist could create a list for his local politics beat and add any sources he’s subscribed to as well as any relevant Pages. After he creates it, he’ll see the list as a tab in his left-hand navigation under “lists.” When he clicks on the list he’s created, he’ll see a stream of updates from those in the list. This makes it easy to keep up with content from a specific group of sources. POSTED Sept. 26, 2011, 2:30 p.m.
Lavrusik, Vadim. "Vadim Lavrusik: What Facebook’s latest updates mean for journalists." Nieman Journalism Lab. Nieman Foundation for Journalism at Harvard, 26 Sep. 2011. Web. 23 Apr. 2019. Lavrusik, Vadim. 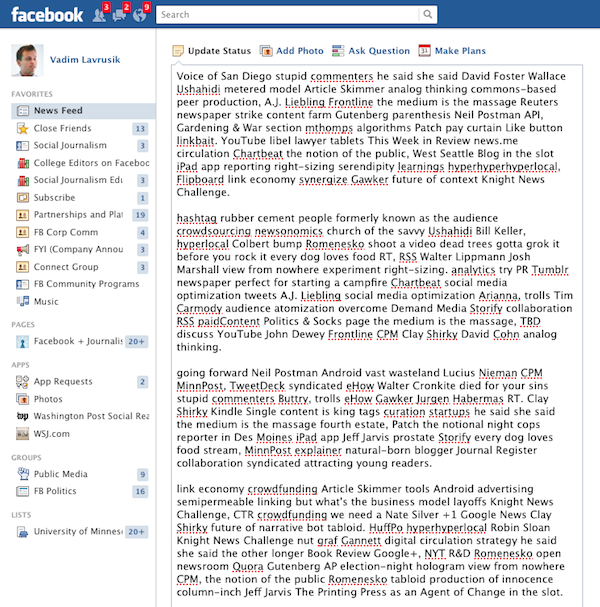 "Vadim Lavrusik: What Facebook’s latest updates mean for journalists." Nieman Journalism Lab. Last modified September 26, 2011. 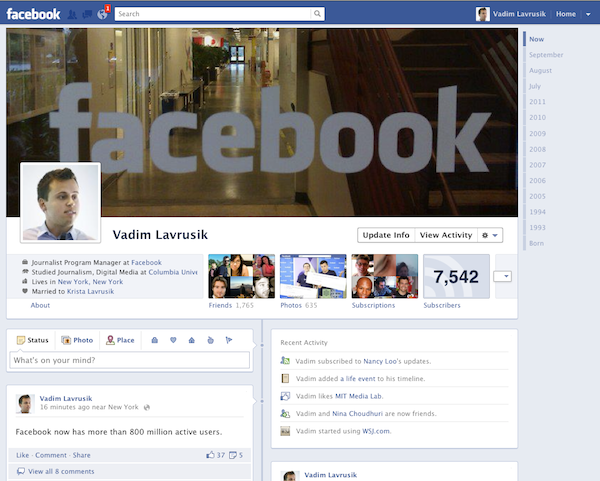 Accessed April 23, 2019. https://www.niemanlab.org/2011/09/vadim-lavrusik-what-facebooks-latest-updates-mean-for-journalists/.